Pennswood Village From Bleeker Street to Bucks County: Meet Henry & Nancy Arnold! For Nancy, when she spoke with her son about moving to a Continuing Care Retirement Community, she was unsure how she would adjust to living with so many people who are close to her in age. Nancy’s son provided some valuable perspective. Henry explained that one attractive element of living at Pennswood is the diversity of residents. The Arnolds enjoy how their neighbors come from many backgrounds, which leads to engaging conversations. Coming from a bustling place like Manhattan, Henry and Nancy were curious to find out how active the community at Pennswood would be. They found a “tremendous range of things to do,” both at and around their new home. Artistic opportunities at Pennswood abound, and the Arnolds are some of the most active residents on campus. While Henry has enjoyed transitioning from his career as a landscape architect to his current endeavors as a professional watercolor painter, Nancy also advocates for art at Pennswood. Nancy helps manage the Resident Art Gallery, which features residents’ artwork and hosts several juried art shows each year for the many serious artists who live there. One of the Arnolds’ favorite aspects about the activities at Pennswood is that they’re all resident-driven. The community has no dedicated activities director, which Nancy said is “remarkable” because it inspires residents to be driven by their passions and share them with others. All of that is related to the unique energy of Pennswood, which Nancy notices every day. 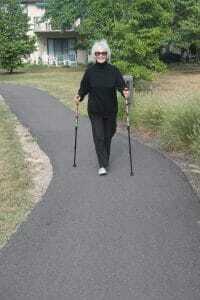 Nancy has taken up Nordic walking to stay fit and stay mobile, and she and Henry take their health seriously. Pennswood’s Fitness and Aquatics Manager, Becky Popik, saw Nancy’s success with Nordic walking, and saw an opportunity to help others at the community. Pennswood also takes pride in its park-like campus, which Henry appreciates. Henry enjoyed bringing part of his landscape architect career to the new home, as he designed the garden beyond the couple’s first-floor patio. 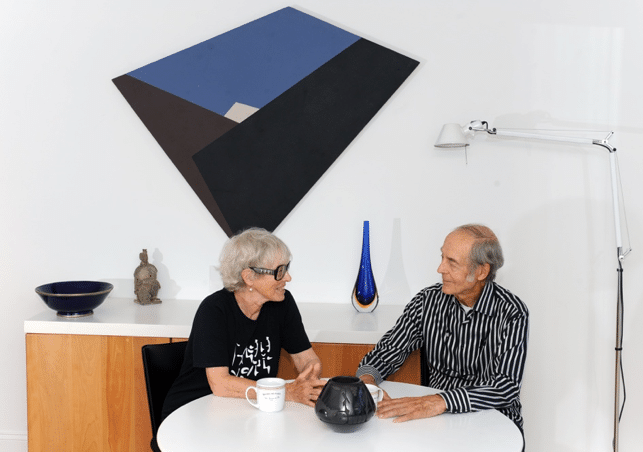 Whether they’re traveling, enjoying art, exercising, or just enjoying time looking out at their garden, Henry and Nancy Arnold have enjoyed making Pennswood their home. When Henry and Nancy visited Pennswood, they knew our community would be a great fit for them. We think you’ll enjoy visiting us, too! To get in touch, simply click here or call 215-968-9110!